Welcome to New York State’s only wilderness canoe region, 18,000 acres of cross-country skiing and snowshoeing from groomed trails on our 25 acres to back-woods excursions. Whether you are a beginner or an enthusiast, young or old, imaginative excursions await! 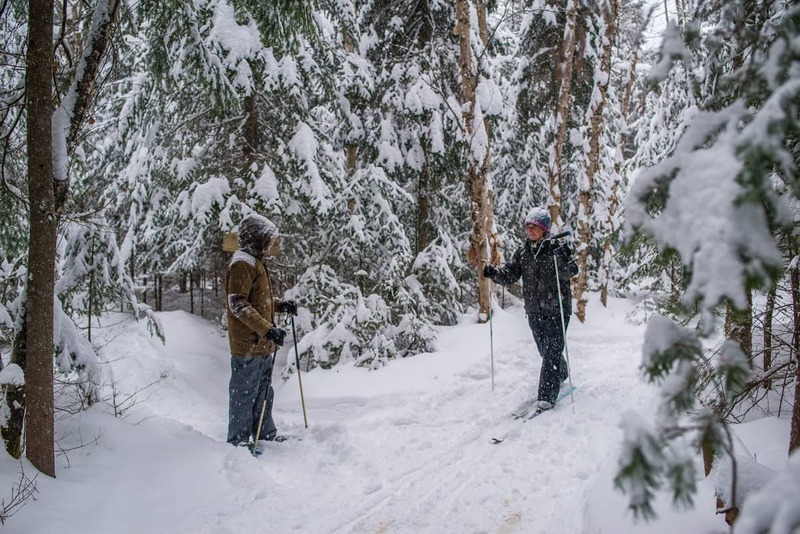 Ski or snowshoe for an hour or escape to back-country trails! Time has stood still while nature has grown unabated since these Sylvan woods were designated “forever wild” in 1892. With our own trails as they meander our 25 acres of woods that take you down to the pristine shores of idyllic Lake Clear – where Einstein contemplated. Take a back-pack lunch from our Old World Kitchen Store and join the Jack Rabbit Ski Trail which nearly connects to our estate. The Jack Rabbit Trail connects us to Paul Smith’s and areas beyond. Start from our property by taking in the wonder of the newly created Excelsior trail (?) that navigates the shores of Lake Clear to the heart of the St. Regis Canoe region and on to Tupper Lake. Arrange for an excursion where you ski one way and be picked up for the return trip. Take the trail in the other direction to Saranac Lake. Within a 5-minute drive, you can explore the diverse wonderland of outdoor trekking. Ski the back-country trails of the Canoe Region. Take in over 25 miles of groomed trails at the Paul Smith’s College Visitor Interpretive Center. 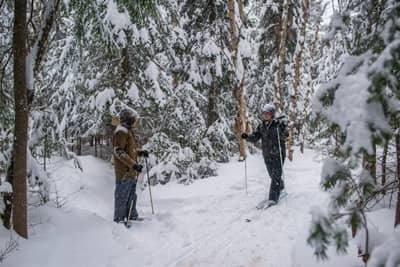 “Mountains, marshes, forests, streams – there’s a huge variety of terrain on our 3,000 acres.” These trails have been recently expanded with the guidance of Olympic athletes. In addition to skiing or snowshoeing pristine wilderness, there is a host of interpretive information at the main building and on the trails which are open year round. Trail fees required. Don’t have equipment? You can rent at the VIC! Within 15 minutes by car, you can explore the trails of Dewey Mountain, a training ground for many youngsters who became Olympic athletes! Within 40 minutes, you can ski the Olympic trails at Mount Hovenberg in Lake Placid. Renting equipment is no problem as you can do that at Blue Line Sport Shop in Saranac Lake as well as other venues. Package this into an Adirondack Winter wonderland Discovery experience with a lantern-lit sleigh ride on our property with a local farm, a Speakeasy experience, History of Beer Workshop or Traditional Cooking demo while you enjoy our Adirondack Alps Restaurant. Finish the evening in front of a nestling fire in one of our artisan lodgings.